WASHINGTON (AP) — Wanted: A million people willing to share their DNA and 10 years of health habits, big and small, for science. CHICAGO (AP) — Children with a rare, incurable disease that causes rapid aging and early death may live longer if treated with an experimental drug first developed for cancer patients, a study suggests. WASHINGTON (AP) — In a quest to end cookie-cutter health care, U.S. researchers are getting ready to recruit more than 1 million people for an unprecedented study to learn how our genes, environments and lifestyles interact — and to finally customize ways to prevent and treat disease. TRENTON, N.J. (AP) — New Jersey Gov. Chris Christie said Monday that pharmaceutical companies agreed to work on nonaddictive pain medications and additional treatments to deal with opioid addiction. The Republican governor made the announcement in Trenton, shortly after he convened a meeting of the White House opioid commission that he chairs. That roundtable discussion was closed to the press. 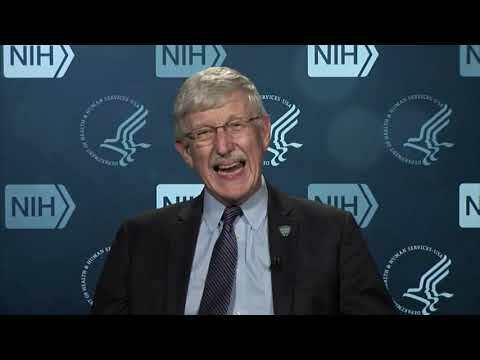 WASHINGTON (AP) — President Donald Trump says he's keeping Dr. Francis Collins as director of the National Institutes of Health. Collins is a pioneer in the field of genetics who has directed the NIH since August 2009, after successfully leading the nation's effort to map the human genome. He was among several dozen Obama administration officials who Trump aides had asked to stay in their jobs — at least temporarily — for the purpose of continuity. CAPE CANAVERAL, Fla. (AP) — Kate Rubins applied to be an astronaut while she was procrastinating about writing a grant application to the National Institutes of Health. So on Tuesday, from orbit, she thanked the director of the NIH for her career. Rubins, an infectious disease specialist who is the first virus hunter in space, was chosen by NASA in 2009. That's the same year Dr. Francis Collins took over the NIH after years of leading its National Human Genome Research Institute.